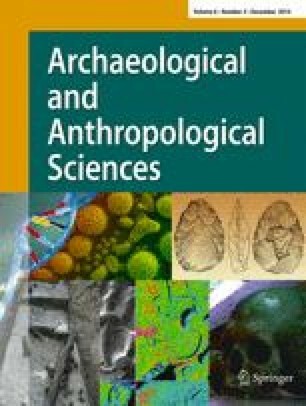 Detailed petrographic and geochemical analyses of 100 sherds of greyware cooking pottery from the large Medieval kiln site of Cabrera d’Anoia have revealed the presence of several compositional groups that are correlated to different phases in the operation of the site. These appear to relate to changes in the extraction of local raw materials for pottery production concomitant with the development of the workshop over several centuries. Macroscopic, microstructural and mineralogical analyses have permitted the reconstruction of a consistent tradition of ceramic manufacture at d’Anoia. Close correspondence between the petrographic and geochemical characterisation of the sherds provides several well-defined compositional reference groups for this major production centre. This is permitting the identification of the products of Cabrera d’Anoia at other rural sites in Catalonia and will provide a firm basis with which to examine the supply and demand of utilitarian pottery vessels in this area during the Medieval period. J.I. Padilla Lapuente passed away during the preparation of the study. The research presented in this paper forms part of the doctoral thesis of Esther Travé at University of Barcelona, which was supervised by José Ignacio Padilla. This thesis was funded by an FI grant from the Catalan Government (2006FI-01369). Ceramic studies are one of the main topics of the Medieval and Post-medieval Archaeology Research Group (2009SGR469), and this work was part of a larger research project on Cabrera d’Anoia funded by the Spanish Ministry of Science and Technology (HUM2007-61551-HIST) between 2006 and 2009. Jaume Buxeda and Marisol Madrid of the Material Culture and Archaeometry Research Group (ArqUB), University of Barcelona, kindly assisted with the XRF and XRD analyses of the ceramics from Cabrera d’Anoia, which were performed at the Laboratories of Scientific and Technical Services. Jordi Illa helpfully prepared the ceramic thin sections, and Miguel Angel Cau Ontiveros provided guidance on their analysis. Jacques Thiriot supervised archaeological fieldwork at Cabrera d’Anoia alongside Iñaki Padilla, in a joint French and Spanish team. Dr Padilla sadly passed away during the writing of this manuscript. Eskerrik asko, Iñaki. Hasta siempre.